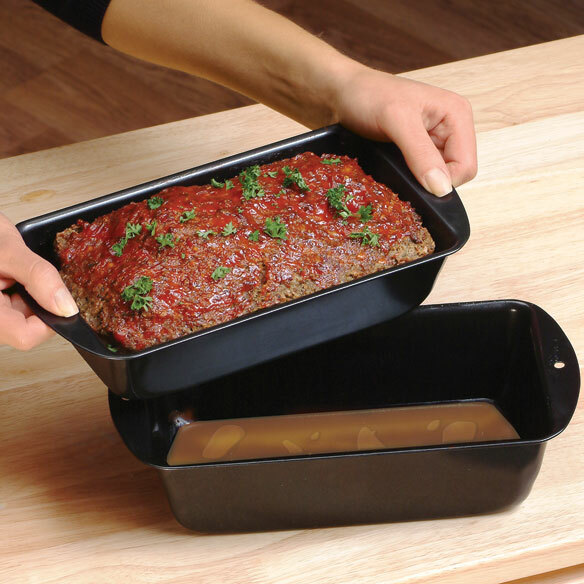 Meat loaf pan with insert drains grease for delicious low-fat meals! Meatloaf pan bakes meatloaf in raised inner nonstick pan...fat drains through drain holes into outer pan. Meat won't soak in grease, even with cheaper cuts of beef. Dishwasher safe loaf pan with nonstick finish. Inner well: 9 1/2" L x 5" W x 1 1/2" D. Outer pan: 11 1/2" L x 5 3/4" W x 2 3/4" D.
I really like it. It is easy to use. I have no complaints about it. This pan works wonderfully. The meatloaf came out great and I didn't have to drain the pan half way through cooking. The bottom part was easy to wash. The top part required some soaking before I could scrub it clean. Love this pan. I use this pan to make meatloaf. The meat does not sit in the fat from the meat as it cooks. It made the best meatloaf I have had in a while. It was easy to empty the fat out as well to clean. I have been wanting this pan for a while and I am glad I got it. Will be giving this as a Christmas gift, but I could see where it would come in very useful. A little different for a cook's gift. I like the fact, the fat dripped into the other pan, yet my meat was tender and juicy. My daughter-in-law, aka gourmet cook of the family, saw the end result of my cooked meatloaf and wanted to know how I managed to keep the grease off. When I showed her the unique meatloaf pan, she wanted one. So, I had to order another one. I'm thinking about getting extra for bride shower gifts, Christmas gifts and just a "thinking of you" gift. Pat - Not known for cooking. A nice pan to make meat loaf in. I am glad I purchased it. Easy clean up, too....food debris comes right off with the lightest scrubbing. The best thing in my Kitchen!!!!! since i got this my family ask once a week for me to make meatloaf. I now have bought one for my mom. I use this for meatloaf & homemade bread. Perfect. Works great! It made the best meatloaf I have made in years. Moist but not soaking in grease. And easy clean up too. I've used this twice now, once for Meatloaf, and it was the best I've had in years. All of the grease went into the bottom pan, and the meatloaf was still juicy. Then I tried it with Chicken Breasts, and got the same result. I love that I can cook anything that I want and the grease just drains away. I will probably be ordering another one, just to have on hand. I liked the price and it works great. I spray the pan before adding the meat. I like that the meat stays out of the grease, and its easy to remove from pan. WOW! NO MORE GREASY MEATLOAF! This inovative meatloaf pan is perfect for whoever wants a juicy, non-greasy, and perfect meatloaf. Just what everyone needs for the best and healthy meatloaf. Love these! They make a much healthier meatloaf. The bottom pan can also be used for baking bread. Best Meatloaf I ever made. Tastes GREAT! I made a meatloaf using this and it was the BEST EVER, NO bottom sogginess and tasted wonderful. Love this pan! I love my pan :). The metal is quality and they are nonstick. I only wish I had bought two!! THE PAN IS JUST WONDERFUL BECAUSE THE MEATLOAF IS NOT "SITTING" IN THE GREASE. I love this pan. The non stick feature as well as the dripping pan.. Can make gravy in it as well. I have been looking for a pan like this since I wore out my old one (after 15 yrs. of use). Very happy Walter Drake had this at a great price! This does exactly as described. Amazing how much oil drained out of the meatloaf yet it tasted the same as one made in a regular pain. So far I make all my meat loafs using this item. Works exactly how it is described. It is small compared to my usual meatloaf, but more than enough for two with leftovers. I always hated seeing my dinner sitting in grease so I was excited to see this product which I have used for years and still looks like new. I just love this pan! Always hated the fact that when i made a meatloaf that it soaked in grease. Who needs the fat? That to whom ever thought of this idea. Works for me. I have three of these pans because I cook/bake and freeze in quantity whenever possible for quick meals for my busy family. No fat collects in the meat, just good flavor. I highly recommend the pan for turkey or beef meatloaf. AWESOME ! ***** Perfect in every way ! this has saved me so much time cooking and cleaning. I adjusted my time to this pan. I use 1.5 pounds plus all my ingredients.. With No problem. But I use 80/20 meat. I wipe off then wash by hand. I have many complements on my Meatloaf since I started using this. I just purchased two more.. Get while they are available as I wanted this last year.. Great Purchase ! OMG!!! It is absolutely great and I was totally shocked at the amount of grease. I bought 95 percent fat free hamburger. Highly, highly recommend buying one and you too will be shocked!!! This helps make the best meatloaf. Not greasy or wet or sloppy and it stays together not turning into sloppy joe mess. Love it. This meat loaf pan is great. It is just the right size for a small family. I think it would be great for baking banana bread. I really like the loaf pan because the meat does not sit in grease. What a great idea...so convenient and without the mess. Healthier cooking of our FAVOURITE beef; without all the grease. This meatloaf pan is great. It keeps the fat in the bottom tray away from the meatloaf. Came easily out of the pan. "I Bought two and I may buy more." " I couldn't beleive all of the artery-clogging fat that was rendered from my first meat loaf that I cooked using high-quality rated meat. I am glad to see that in a collector rather than my family's bodies." I was very impressed with the Lowfat Nonstick Meatloaf Pan, especially since I could not find it at any "As Seen on TV" sales in stores. It does a great job draining all the grease from the meatloaf and leaving the meatloaf juicy and delicious. I would recommend this to all cooks. No more greasy meatloaf! I was shocked to see how much grease was in the bottom of the pan the first time I used it. Now I feel better about serving meatloaf to my family. I hand-wash this pan just because I don't want to take the chance of it rusting in my dishwasher. Easy to clean. This pan is neat, cuts down the grease when you make meatloaf! Much healthier to eat. Easy to use without the mess of other meatloaf pans. This is my 3rd pan. I have used these pans for many years. I especially like that you can cook the meatloaf and let the grease drip away from the meatloaf. Easy to use. Clean up in soapy water then in dish washer. Throw unwanted grease away. this should be just the right size for what I need it for. I will recomend my friends to purchase this item. Yes I have already recommend this pan to a friend and have given one as a gift. I like that the fat drains away from the meat and it is easy to clean. We like meatloaf but not the grease that normally accompanies it. The meat loaf my husband made in this pan, however, was delicious and totally grease free. This pan will be used often. Very good product. I like how it keeps the grease of my meatloaf. It truly does keep the fat away from the meat so my family can enjoy a non-soggy, non-greasy lowfat meat entree. I will definitely buy more as gifts. Love this pan. It is great for those watching their fat intake, all the excess fat collects in the bottom pan and clean-up is easy. This product works very well, easy clean up which is important to me (I wash my own dishes no dish washer) and the meat loaf was done with no greasy taste. Love it. This is the best way to cook a meatloaf and not have it with grease when finished. Meatloaf made in this pan tastes nothing like your traditional meatloaf (steeped in grease). I used to make it once a year (if that). Now I want to have it every week! I got one for myself and, after using it, two more for gifts. Use it to make my Mexican meatloaf....much better than what I was using! The item was everything as advertised. The meatlaof has a much better flavor becuase so much fat/geease has been eliminated. As stated before, my wife loves it. Need I say more? This loaf pan is the best! This will be my 2nd Meatloaf pan in 6 years and I really love it. The meat is not greasy when you remove it and is easy to clean. Haven't used it yet but had one in the past and they work great so I anticipate no problem. I use this pan for meat loaf and it made the best I have ever eaten. Our 2 1/2 year old granddaughter actually ate 2 pieces. There was no more grease in the bottom of the pan and it is so easy to clean. This was just the easiest pan to cook my meat loaf in and the grease didn't accumulate in the baking pan itself. I love love love this handy kitchen tool. Meatloaf turned out so good. Very convenient! This pan replaced my old one. perfect pan for meatloaf! ! Makes delicious meatloaf! Drains the grease away from the meat. I would buy this pan as a gift for my granddaughter. Wow, the quality and durability of this pan, was not what I expected. It was more. I thought oh man, is this going to be garbage. NOT. It was a nice pan! This worked great. No problems, no issues. Great product, now a days most people have to watch their food intack and this product keeps the hamburger greese off the meat. Great! I had almost stopped making meat loaf due to the danger in pouring off the grease. Wow! So Easy! Easy to clean pan as well. Used it Sunday and it did a great job. It worked great for meatloaf. The loaf did not soak in a pan of grease while cooking. By using this draining pan, less fat is eaten, especially with meatloaf! I love these meatloaf pans this are the best. I have had mine for 4 or 5 years and they have held up for good They don't do good in too high of heat but learned to lower the temperature while cooking my meatloaf to 375 degrees works better. I put them on top racker of my dishwasher and they come out very clean. I do spray these before I put food in them because it keep the meat coming out better. It is nonstick just what I do. I would recommend this product. I actually bought these for a Christmas present. They are hard to find in regualar stores so this is a great deal. It's healthier that the meatloaf isn't setting in the grease while it's baking. Made a leaner turkey meatloaf. Useful for special diets. I found it difficult to separate the two sections when the pands were hot. I appreciated that it cleaned up in a snap. I made my first meatloaf. It was great to see the fat at the bottom of the pan, and not seeping from the meatloaf! Plus it was easy to transfer the meatloaf on to the cutting board with the handles! I used the pan to make a 1 lb meatloaf and it worked great. The uky stuff I use to have to figure out how to drain without dumping meatloaf into the sink is now in the lower unit, easy to dispose of. I had hoped the pan was a bit bigger because I usually do a 2 lb meatloaf but now that it's easier I'll just do the 1 lb. Thank You! I used this to make a meatloaf for my family it did ok until I had to was it I rinsed it off and put it in dishwasher but when I pulled it out of dishwasher I still had to scrub it more because some meatloaf was still stuck on the sides. I got this because I don't have a regular full-sized oven but only have a countertop toaster oven, and I want to be able to make meatloaf. The outer pan is about as large of a loaf pan as you can get and still fit in toaster oven. There isn't much room between the bottoms of the 2 pans for holding grease, so you'll be limited to using ground beef that's 90% or better (or else grease will back up into the inner pan). But the bottom of the meatloaf can still be soaked with grease, because there are only spaced-out holes for grease drainage. Looks like the way to go, with any %age of fat, is to just use the outer pan and put layers of paper towels on the bottom (more for higher-fat ground beef), so all the grease gets soaked up by the paper instead of by the meat. The product is for baking, I use it for meatloaf because it drains off the grease. It is smaller than the picture makes it look. Having two pans to wash (yuck), but can be used to bake my nut breads. The section that holds the meat is not as big as I would like... needs to make meatloaf more the size of the lower loaf pan... that way there are more leftovers for sandwiches the next day. Really helps eliminate the grease from the meatloaf. Lost similar product, won'the make meat loaf without it. Quality is great. I use the pan to decrease the fat in our diet. It is convenient and doesn't take a lot of clean up. It is easy to store because of it's small size and goes in the dishwasher. i have used this product for approx. 5 yrs. I prepare aa meatloaf for dinner.It is practical and healthy. If you like more grease in your food, then this is not for you. However, if you DON'T like more grease or fat, then this IS what you need. Might buy this product again. Designed to drain grease from prepared baked meatloaf. I *love* the fat dripping to the bottom pan. But food stuck to it. Soaking helped but was insufficient. Removing baked on food -- using only plastic scrubs -- left scratches. Finally am tossing it for fear of eating pieces of non-stick finish. Also, you are always cleaning 2 pans, instead of one. You might try lining the outside pan with foil to cut down the cleaning. I like all the features of this pan except the meat section isn't deep enough. I make 2 lb of meatloaf at a time. This pan only allows for a 1 lb loaf. I'm disappointed. This pan does a good job of draining the fat from the meatloaf. However, the top portion is too shallow to make a very deep meatloaf. I would like for it to have been deeper. Otherwise it is easy to use and clean. After my meatloaf was taken out of the oven and I put it on the platter, I notice that the pan coating had peeled of the container. I had to scrap the coating off the bottm of the meatloaf (I only have and use plastic utensils). The pan itself is quality construction. The only drawback is: It's small. Your meatloaf needs to be about 1 pound and no larger because the drain holes clog if you put too much meat in. And a 1 pound meatloaf isn't large enough to feed a family of 4 (at least not mine). Keep in mind that if you put more than 1 pound of meatloaf in the pan and the holes clog, the grease goes where? Yep! Over the sides, so use a cookie sheet under it. Now I cooked a 2 pound pork tenderloin in it and it turned out very well. Moist and rendered the fat right out of the holes. I made a meatloaf for the family using 1.6 lb. of ground beef. I was excited about having the fat fall to the bottom pan and keeping my meatloaf mostly fat-free. However, the picture of the product with the meatloaf is DECEIVING!!! I filled the pan with the meatloaf, taking care to push down along the edge. The fat overflowed the pan because the meat itself stops up the holes that are meant to drain the fat away!!!! I was very disappointed in this product. The insert pan which holds the meatloaf is very shallow and not conducive to holding enough raw product to feed a family of 4. I bought this meatloaf pan thinking it would FINALLY solve my problem of too much grease in my meatloaf, but it turned out to be NOT nonstick, meaning some of the contents had to be scrubbed off, and when I did that, the coating came off. Not good! I threw it away, and purchased a Pyrex glass loaf pan. Anything left on the sides soaks off quickly with hot water, and I'm no longer worried about whatever was in that coating getting into my food. Sorry but I was really disappointed. THE PAN IS TOO SMALL. Non stick surface on the bottom of the pan that the meatloaf goes in came off. I will not use this again because I don't know what will come off on my meatloaf. I will not be using this again after the coating came off. I had an other meatloaf pan similar to this. I thought this one might be nicer. I guess it is best to stick with my older one. I'm not using something that we are eating the coating. The inserted pan that holds the meatloaf is not deep enough. The description says its 2 3/4" deep, but I measured it and its only 1 3/4" deep. Its not worth the effort of making a nice meatloaf if its only going to be 1 3/4" high. The construction is sturdy and it looks like a good pan, bit its not as deep as I would like. Its not worth the hassle of returning it, because they would subtract $7 for the shipping label from my refund and I would only get $2.99 back. I'm very disappointed. Experiences like this make u wanna take a break from mail/online ordering. I will call WDrake and see if they can do anything for me and will let you know. Wanted a meatloaf pan that separated grease from meat. I want to make a meatloaf that is smaller than my big pan. Needed a meatloaf pan with drainage and this pan was reasonably priced (and nonstick) and just what I wanted. I had one previous and liked it. Looks same as others. Medium price. I have used this type of pan before and they are great! Used before and makes good meatloaf without all the grease. Needed new pan. I haven't used this yet as I just ordered it but from the reviews, it looks like something I can use. looses all greasy juices when you seperate pans. Old pan was a mess. I have seen this for a long time and have decided to try it with the good reviews. I wanted a pan that did not soak in the grease when cooking meatloaf. I had one of these that I really liked but it was misplaced so needed another one.